Last week’s Anglesey Show was yet again a brilliant showcase for Anglesey and its rural communities. The Show is such a highlight of the year, a time when the whole island comes together for a chat, and there is always so much to see and do on the showground. This year, I had the pleasure of awarding a very young competitor – only 3 years old! – who was exhibiting piglets, got to play Digartref Ynys Môn’s Chocolate Tombola and congratulated many a new venture on the island such as Bodlas farm produce and young farmer Huw Evans’s ‘Twrw Mawr’ Disco and PA. I also learnt about the Red Cross’ new First Aid app – a fantastic idea, and a very useful app to have at your fingertips. 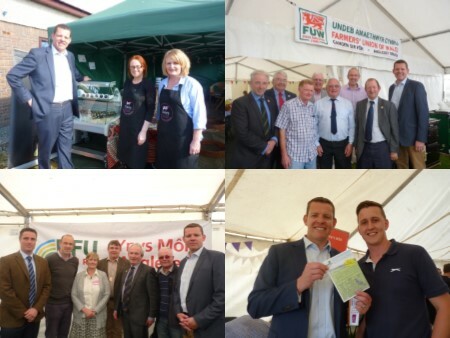 I had the opportunity to meet representatives from the FUW and NFU at the showground. These are not the easiest of times for farmers, with prices paid for milk and their animals falling. I talked to farming unions at length about this and other issues including Single Farm Payments and the need for clear and honest labelling so that consumers know what they are buying and are able to make an informed choice.